HB Kruger and Stuart Marais produced another solid day of racing to claim their second consecutive stage win in the Liberty TransCape MTB Encounter today. Riding from Wilderness to Mossel Bay, the ASG-Ellsworth team showed their strength up Outeniqua Pass, breaking away to register another comfortable stage victory. The finished in 3:15:01, three minutes ahead of the French-German pairing of Antonin Marecaille and Julian Biefang (Chiru-Magura-Canyon). Norwegian professionals Eirik Fiskvik and Thomas Engelsgjerd (Happysalmon) took the third podium spot, seven minutes behind the leaders. After two days, Kruger and Marais (5:38:48) have built a lead of nearly nine minutes over Marecaille and Biefang in the general classification, with Fiskvik and Engelsgjerd a further two minutes back. Riding with Marecaille and Biefang after they broke away from the main bunch, Marais said they made a move up Outeniqua Pass. Marais said he and Kruger, who is from Paarl, were working well as a team despite it being a new partnership. Tomorrow’s third stage of 102km will take the riders from Hartenbos to Riversdale. Belgian Kristof de Neys and British partner Catherine Williamson (LawPack) remained the pace-setters in the mixed category after winning the stage in 3:50:48. 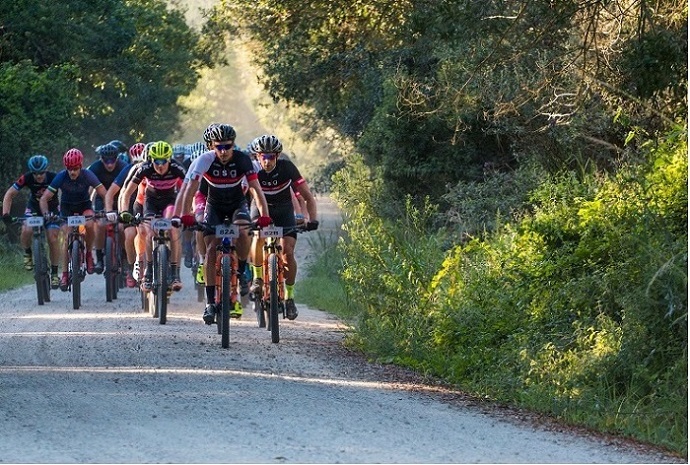 The 614km race, supported by STANLIB and Volvo Cars, takes riders through many of the Western Cape’s iconic trails before ending at La Couronne Wine Estate in Franschhoek on Saturday.